Time for the third monochrome nailart of the month! 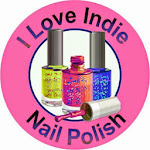 This week, I chose pink, and it got very messy! I couldn't resist this cute splatter stamp! I started with a base coat of the gorgeously neon sparkly pink of Different Dimensions Cosmic Ray. Then, I layered the stamps between MdU Pastel Pink and Hit The Bottle Watermelon Splash. It was actually hard to see Watermelon Splash directly over Cosmic Ray, but fine over the Pastel Pink. 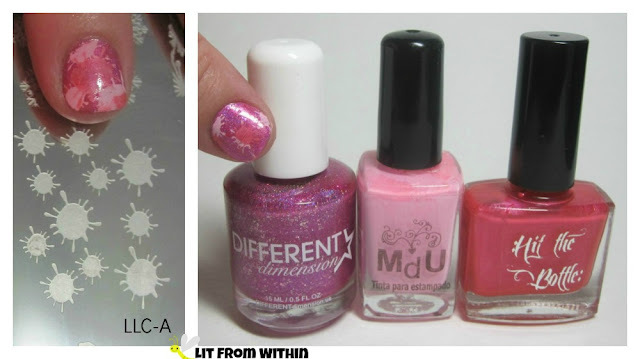 What I used: LeaLac LLC-A stamping plate, and Different Dimensions Cosmic Ray, MdU Pastel Pink and Hit The Bottle Watermelon Splash. I've never been very good at the real splatter nailart, but this stamp made it easy!